This page goes over the Character class, the state machines it uses, and how to use it to create your character. 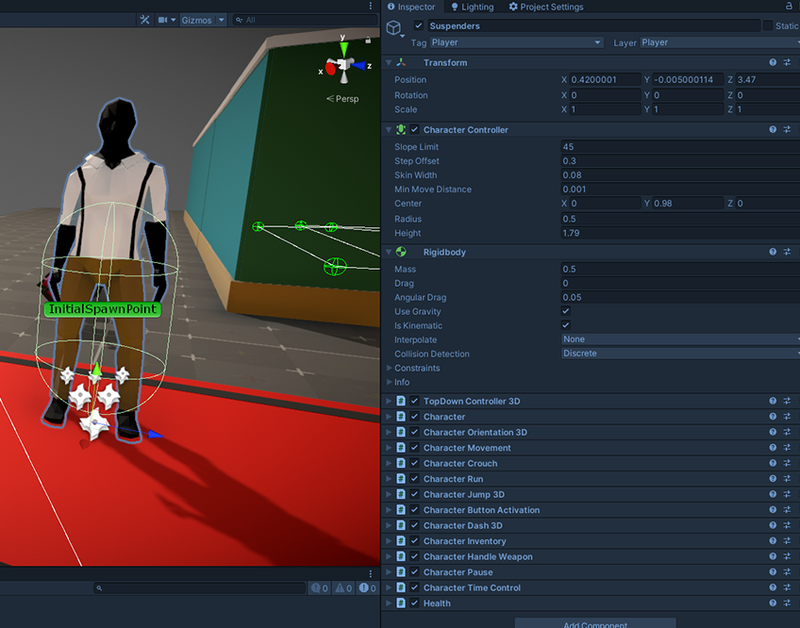 Every character in the engine will need a number of components to work. Some of them are specifics to 2D, some of them to 3D. Most of them are common. 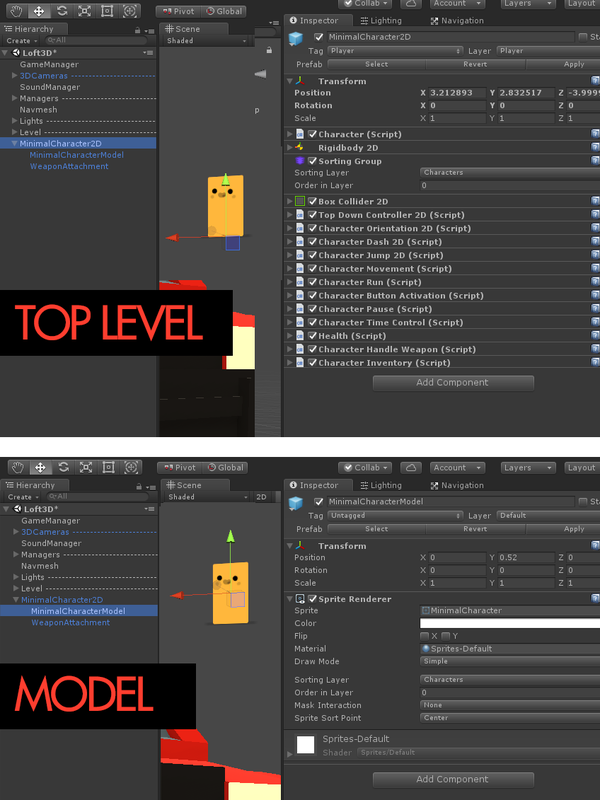 This page will give you information on the major ones, that you need to know to create characters smoothly in the TopDown Engine. 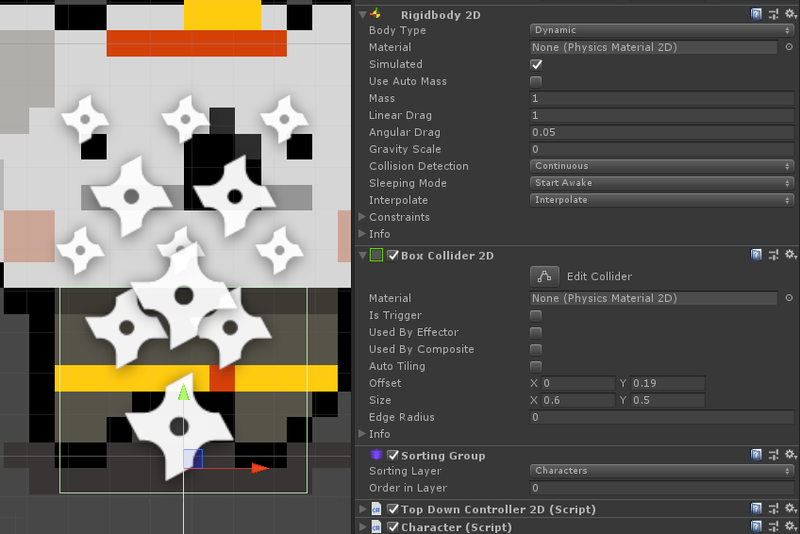 If you’re going for a 2D character, you’ll need a RigidBody2D component (Dynamic, Continuous Collision Detection, Start Awake, Interpolate), as well as a BoxCollider2D (non trigger). There’s no rule or obligation when it comes to setting up that collider, but I like to have mine encompassing half of the bottom part of the character, like in the image above. This will allow the head of the character to get in front of walls above it, and generally gives a good illusion of the position the character occupies on the “ground”. Additionnally, you may want to use a SortingGroup component, set to the Character sorting layer. This will automatically handle sorting so that your character appears “behind” objects that are lower on the Y axis, and “in front” of objects that are above it. 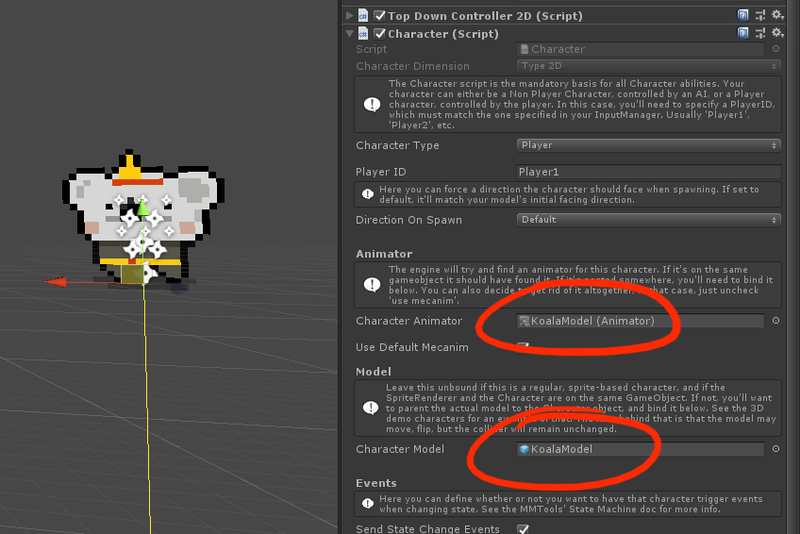 If you’re going for a 3D character, you’ll need a RigidBody (kinematic, uses gravity, Discrete Collision Detection), a Character Controller, and an additional Capsule Collider, set as IsTrigger. Both the CharacterController’s height/radius and the Capsule Collider should be approximately the same size, with the CapsuleCollider being slightly larger (by 0.01 would be enough). Then your character will need a TopDownController. Pick either the TopDownController2D or TopDownController3D version, not the base one. Both have slightly different settings, but mostly you’ll want to make sure that the layer masks are properly set (the layers the controller should consider as ground, walls, etc). This is the central class that will link all the others. It doesn’t do much in itself, but really acts as a central point. That’s where you define if the player is an AI or player-controlled, where its model and animator are located, stuff like that. It’s also the class that will control all Character Abilities at runtime. It’s a very central class. From its inspector you’ll be able to define a few things. If it’s a player character, the PlayerID field is very important. It has to match exactly the one in your InputManager (that’s how the InputManager knows what characters to control). The Health component handles damage, health gain/loss, and eventually death (and rebirth). It’s mandatory if your character can take damage. Its various methods will allow you to remove / add health points from the initial health value, it’ll handle damage and the associated effects (visual and in terms of collisions etc). The last (but not least important) part of your character will be the Character Abilities. The asset comes packed with more than 15 abilities, from simple ones like CharacterMovement to more complex ones like weapon handling. They’re all optional, and you can pick whichever you want. You can of course also easily create your own abilities to build your very own game. You can check this page for more details about Character Abilities.